WALTHAM, Mass. 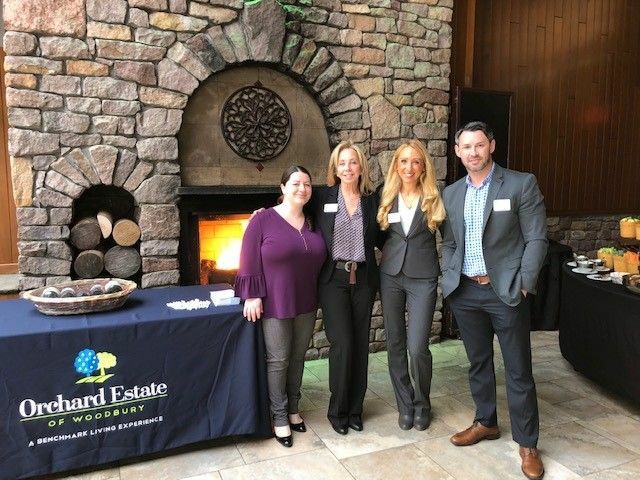 - Jan. 15, 2019 - PRLog -- Orchard Estate of Woodbury (https://www.benchmarkseniorliving.com/senior-living/ny/woodbury/orchard-estate-of-woodbury?utm_source=press-release&utm_medium=press-release&utm_campaign=comm-wby-press-release-welcome-center-opening-jan19), a Benchmark community committed to keeping its residents and families connected to what matters most, will bring assisted living and memory care to Woodbury, N.Y., for the first time. With the permanent location presently under construction and slated to open by early fall, today Benchmark (https://www.benchmarkseniorliving.com/?utm_source=press-release&utm_medium=press-release&utm_campaign=bsl-corp-press-release-wby-welcome-center-opening-jan19), a human connection company and the Northeast's leading provider of senior living services, is celebrating the opening of the Orchard Estate of Woodbury Welcome Center located at 550 Woodbury Road in Plainview. At the Welcome Center, situated in the former Diamond Drugs location just a quarter of a mile from the construction site, potential residents and their families can learn how to become members of the community's exclusive Founder's Club--by placing a priority deposit. In addition, information about Benchmark's comprehensive services, lifestyle amenities and floor plans are also available. "Opening our welcome center is a big next step in our evolution, and we couldn't be more excited," says Doug Cormack, Orchard Estates' executive director. "We are hearing from many people in the community that they are happy we're here. They want to remain in the area as they get older, but living on their own, especially during the winter, is too challenging, and they want that sense of community. The response we've received is truly unprecedented, and everyone has welcomed us with open arms." Orchard Estate of Woodbury is named after Theodore Roosevelt Jr.'s beloved family home, Old Orchard, which was gifted to him and built on former farmland. When completed, the community will offer 89 assisted living and memory care apartments for up to 102 residents and spacious common areas. Set on 3.8 prime acres located on 900 Woodbury Road near the intersection of Route 135 and the Long Island Expressway, the environmentally friendly community will feature a modern, contemporary design and amenities such as a bistro, wellness center, family room with full kitchen and dining room, second floor balcony and landscaped walking paths. The community will have an enhanced assisted living license enabling it to provide a wide range of care; licensure is pending. "With only 89 apartments available and many deposits already placed, we encourage anyone in the community who is interested to visit us and place a deposit as soon as possible to ensure that we can provide them with options to meet their precise needs," says Cormack. Orchard Estate will be Benchmark's second New York community. The first, Whisper Woods of Smithtown, also on Long Island, opened in September 2018. For more information about Orchard Estate of Woodbury visit the website (https://www.benchmarkseniorliving.com/senior-living/ny/wo...) or call the Welcome Center at 516-595-0599. Based in Waltham, Mass., Benchmark is a leading provider of senior housing in the Northeast with 6,500 associates and 58 communities. Founded in 1997 by Tom Grape (https://www.tomsgrapevine.com/toms-posts/2017/8/8/we-made...), Benchmark offers independent living, assisted living, Alzheimer's care and skilled nursing in Connecticut, Maine, Massachusetts, New Hampshire, New York, Pennsylvania, Rhode Island and Vermont. The organization was selected by FORTUNE magazine for its inaugural 2018 Best Workplaces for Aging Services list, taking the number 16 spot on the list of top 40 aging services companies and ranking number three among companies with more than 40 communities. Benchmark is one of only six companies named to The Boston Globe Top Places to Work list every year of the 11 years it has been published. And it has been consistently recognized by Boston Business Journal, Hartford Courant and Hartford Business Journal as a top workplace, and by the Boston Business Journal, Providence Business News and Hartford Business Journal as one of the healthiest employers. Click here for more information (https://www.benchmarkseniorliving.com/?utm_source=press-release&utm_medium=press-release&utm_campaign=bsl-corp-press-release-wby-welcome-center-opening-jan19).